Oh, these are the droids you're looking for alright; it's clear from the moment you pull into the parking lot. The back seat time from the Westside to Orange County was (apparently) nothing compared to the unreasonable wait between spotting the storm troopers outside the museum's front door and getting to jump out of the car and see them up close. Those guys with the inter-galactic battle blasters make sure that everyone arrives in the spirit of things. Not that people seem to need help with the spirit of things; we saw more Jedi knights walking around the Discovery Cube on Saturday than most people spot at a Jedi Council meeting. Or something like that. My son assures me I know nothing about Star Wars. Luckily, we all know a whole lot more after spending an afternoon at the Discovery Science Center's exhibit Star Wars: Where Science Meets Imagination. I'm tempted to say that the title says it all, but of course there is plenty more to be said - like what a fabulous idea for an exhibit! This show started in Boston back in 2005 and has been cruising through all the best science museums ever since (if you heard about one at the California Science Center in 2007, this was it), illustrating fascinating scientific principles through the use of Star Wars concepts, props, and characters. Whether you missed the exhibit in 2007 or have just been waiting five years for a second peek, Orange County's Discovery Cube has you covered through April 15. The first set of oohs and aahs comes from several displays of original costumes and props from all six films. Fans of all ages - and I do mean all ages - get downright giddy checking out Princess Leia's costume, a few giant wookie suits, the original Darth Vader suit (boy that David Prowse was tall! 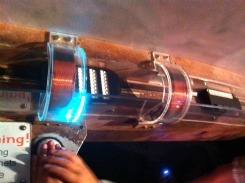 ), individualized light sabers from every character who ever wielded one, etc... These treats, however, are but the bait on the hook, and the hook is science. The first interactive display to draw us in was an opportunity to build and try out Lego-based hovercrafts that - if constructed correctly - actually hover. Kids need to experiment with magnet configurations to find just the right balance to make the crafts float, and electromagnetic coils do the rest. Kids old enough to multi-task contemplating the different kinds of magnet while flying their creations along the tracks learn even more. Speaking of hovercrafts, there is also an opportunity to hop into the driver's seat of a human-scale version. A one-seater landspeeder sits in a small rink and is anyone's for the riding (a guide turns the air on and off, preventing anyone from hogging the hover). That two minutes alone made the trip worthwhile for some people I know. Another corner of the exhibit offers kids the opportunity to build and program their own droids, first piecing together an R2 series robot from parts, then bringing it over to a computer station to create and download a program for running an obstacle course. The entertainment potential here is endless. Really, endless - in that "They're closing the exhibit and we need to get dinner" kind of way. My personal favorite, much to my surprise, was the Millennium Falcon ride (separate admission of $5). To be honest, I hate virtual reality rides and generally avoid them at all costs; I find virtual motion sickness more objectionable than the real kind. But I knew we couldn't drive all the way to Santa Ana and not ride in Han Solo's jalopy, so I sucked it up and braced myself for a nauseating assault on the Death Star. I was the most pleased person in the space ship when I discovered that the Millenium Falcon was another bit of meticulously designed bait which didn't set off for a galaxy far, far away until it had thoroughly explored our own solar system. It was without a doubt the coolest way I have ever contemplated our neighboring planets, and even when we launched into hyperspace to find other galaxies, we didn't blow them up. We behaved more like, well, scientists. The one word of warning I would offer is that weekends can get pretty busy, so getting in early is a good idea. If you arrive in the middle of the day, you'll likely encounter a wait of 20 minutes or more to get in the front door. The exhibit and the Millenium Falcon ride both require extra tickets in addition to general admission; members and those purchasing in advance online can get discounts. Also, kids who come in costume on fan days get free general admission - but be prepared for some extra-long lines on those days. Finally, a few parting words of wisdom, just to make my son cringe: May the Force be with you. 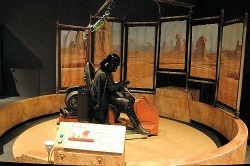 Star Wars: Where Science Meets Imagination is at the Discovery Science Center until April 15, 2012.